If you want to get ahead, get a hat! Another journal page I finished earlier this week - it was so hot, I couldn't bear to sit at the computer, so I had a nice time playing around with paints and things. It's actually not that often I have some playtime, so I made the most of it. 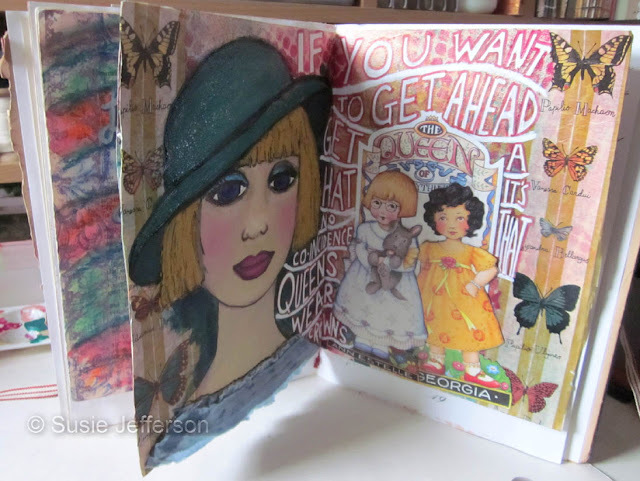 This journal I made is upcyled and recycled: vintage book covers, a mad mix of papers of all shapes and sizes, including vintage children's stories, sheet music, art paper etc. Here, you can see the stitched satin ribbon layers hanging off the page to make the collar. This one sort of made itself - I'd done a rough sketch demonstrating how to draw a face in one of my journal classes way back in May or June, and it was a real mess (green and black crayon). But as it was on the back of another (finished) page I didn't have the option of just ripping it out. So while I had the acrylics out, I started noodling around, and here you are! Anyone who came to my journalling class should recognise this one - especially with that hat! Which, incidentally, now has a thick layer of Tim Holtz's Rock Candy crackle glaze to give that texture. The hair is Viva's Terra textured paint in Ayptian, applied heavily with a palette knife. The paper dolls are from a late, lamented Mary Englebreit magazine (I really miss those, what a shame she stopped doing them). I've really enjoyed doing this one! You do a wonderful job on making the journals. I love it. So cute. Ohhh I am running out to grab me a hat ! LOVE your journal pages, always like work with texture. Wonderful journal page. Love your girl and her hat! I miss the Mary Englebreit magazine, too. Happy Pinks, Susie! 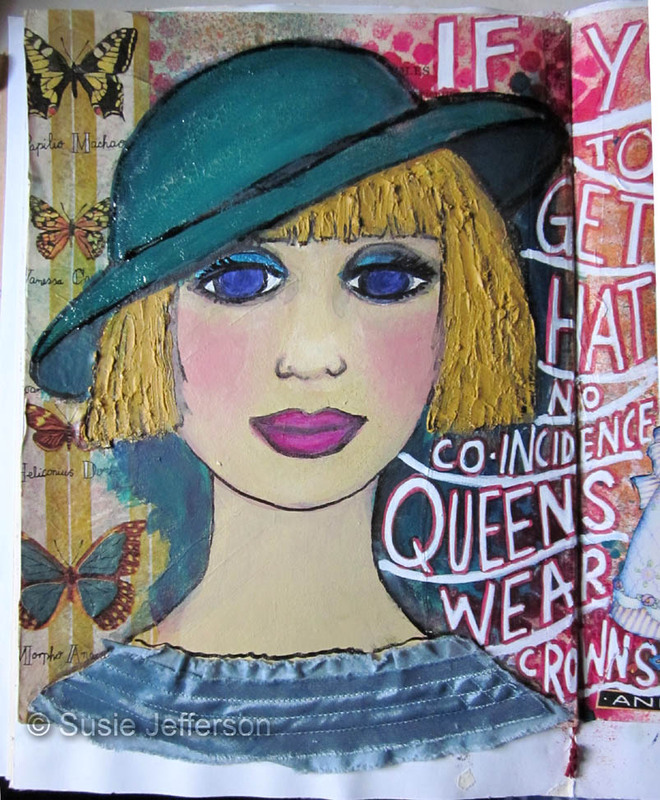 Well, I'm a hat person, so I'm lovin your cute hat journal page! Thanks for your visit and have a great weekend. You are so talented! Your artwork on your journal pages is amazing! 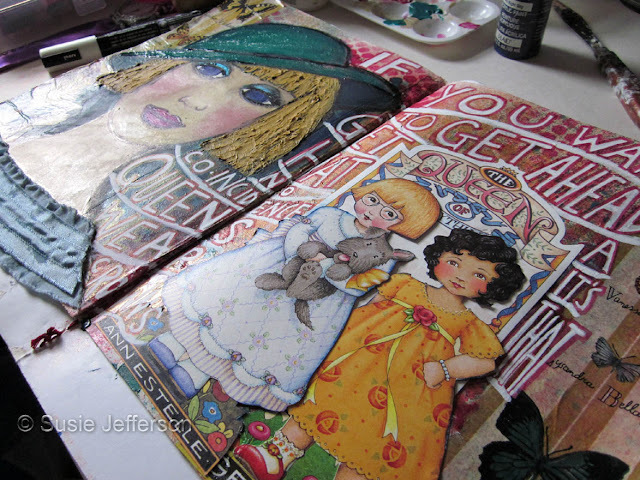 Beautiful and tender, I like this double page in your art journal. I love your journal! I have a few ME items myself. You know - I'm always finding such cute ideas in blog land. I end up appreciating them so much but not trying them. I just might give in some day and see what I come up with. Love the face, hat, fabric - paper dolls and everything! I think everyone's ready for fall and cooler weather. We'd still love some rain (and cooler weather). Thankfully it's not the weather we had (or didn't have) last summer! Stay cool! Thanks for stopping by and leaving me a note on my blog! This is a wonderful journal page Susie!! I miss the Mary Engelbreit Home Companion magazine too, an all the adorable paper dolls she created at the back of each issue!! Thanks for stopping by my blog for Pink Saturday, this is the FIRST time I've ever had my own REAL crafting space, I'm so happy about it and can't wait to start figuring it all out!! I've barely had my own table space in a corner of the bedroom or family room in the past - not condusive to creativity!Hope you have a fun Pink Saturday! That is awesome! So pretty and fun and creative. I feel like a hot mess just looking at the crafty stuff I can't do. 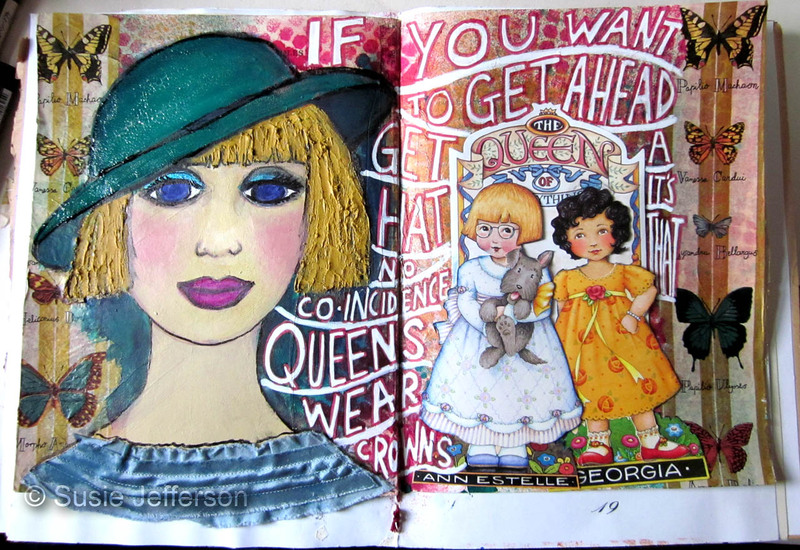 Wow stunning journal pages - very inspiring! Happy Pink Saturday! Susie, Your girl in the hat is so cute. Your journal pages are original and charming. I truly love them. Your girls face and hair is darling. Who could not love those pretty big eyes. Good job. It's beautiful as usual, Susie. I'm a huge ME fan. I don't think I've come across anything of hers that I don't like. Stay cool...and keep creating. Absolutely gorgeous! Hopping a little late from Pink Saturday. My PINK, come and see when you get a chance. She's absolutely fabulous, Susie! Love the texture in her hair and hat. The way you've shaded the hat is incredible... it looks totally 3D! Huge collage fan, huge Mary E fan, and huge You fan. I love this page! fabulous journal pages! The images are just lovely... it's so nice to see ME's images being used for inspiration. I too love her magazine and have saved almost every issue, which I like to peruse for my own inspiration of whimsy.